Postcard US-2663940 is travelling to Indonesia showing Middle Bay Lighthouse, also known as Mobile Bay Lighthouse, that is located at the center of Mobile Bay, Alabama. The hexagonal shaped prefabricated screw-pile lighthouse was first lit in 1885. The keeper's wife gave birth to a baby at the lighthouse in the summer of 1916 during World War I. However, she was unable to nurse the newborn baby. The keeper brought a dairy cow to the lighthouse and created a coral on the gallery at the lower deck. All had to be evacuated when the lighthouse survived a hurricane but sustained damages that year. The light was automated in 1935 and deactivated in 1967. It was placed on National Register of Historic Places on December 30, 1974. 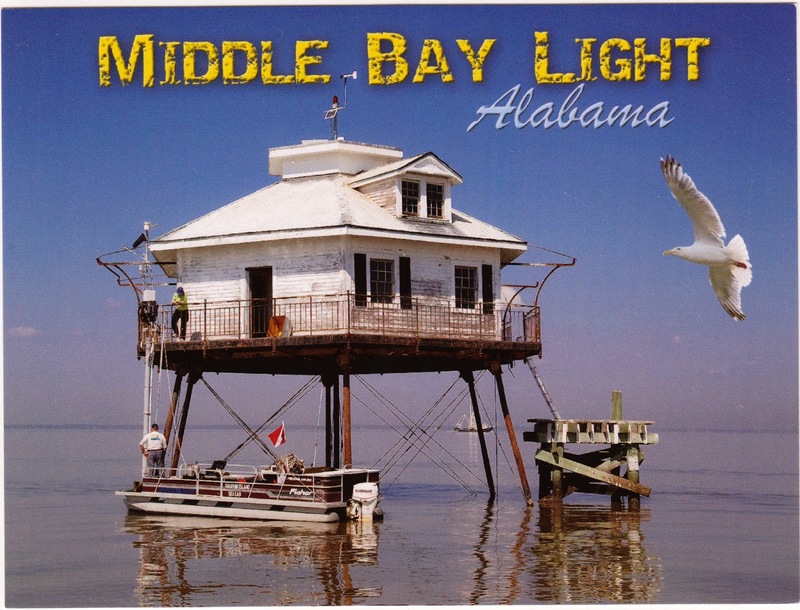 To learn more, visit the Alabama Lighthouse Association's web site. Postcard photo by Carol Highsmith. You can purchase a copy at zazzle.com.